The Star Trac Pro S treadmill is one of the biggest home treadmills you will find in the market today. Unlike most Star Trac models, this one is actually built for the home market (although with its size and power, I wouldn’t be surprise if this machine is used on a commercial setting). 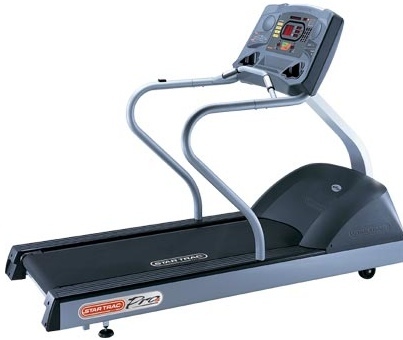 This machine is perfect for people who want a treadmill which they can depend on for years and years. However, if you’re buying this model be sure that you have enough space at home to situate it. This is a huge treadmill and some people might not have a big enough space inside the house to install it. Just like previous Star Trac models, the Pro S also comes with an Aero Bar, a handle on the rounded cusp of the console. It is an innovative handle designed to make it easy for you to grasp for extra stability. The 3.0HP continuous duty DC motor can consistently deliver power even during a long period of time without overheating. It has speeds of 0.5-12.5mph on 0.1mph increments, and an incline range of 0-15% through 0.5% increments. So it doesn’t matter whether you’re a beginner or an advance runner, this machine can give you the workout you need. The 20” x 62” tread belt provides enough room for even the tallest of people (who normally has bigger strides) to run comfortably. This running surface also features the Soft Trac® triple cell cushioning system which maximizes protection by minimizing running-related injuries. The Star Trac Pro S treadmill also boasts of a load-sensing auto shut-off feature that automatically stops the treadmill when no one’s on it. Plus, there are two separate stop buttons that are highly visible in key areas for added safety. The IntelliTrac™ intuitive animated display is an enhancement of the typical dot matrix display. It gives users the ability to choose one of the automated Workout Partner™ selections which includes an Athletic Partner, Climbing Partner or Weight Management Partner. The iPulse™ heart rate system monitors your heart rate. It has an independent window with interactive heart rate chart, and constant pulse detection to make it easy for you to monitor your pulse rate. There are 7 pre-programmed workouts included in this machine. One of these is the Dynamic Heart Rate Control™ program which was designed to continuously monitor heart rate and adjust elevation and/or speed to keep heart rates at a desired training level, thus creating an interval training effect for optimum heart rate training. Other features include a Star Trac sport utility display where you can put your reading materials, water bottle, and ipods, and a maintenance diagnostic mode where you can check potential problems in your machine before they occur so that they can be prevented. The only drawback with the Star Trac Pro S Treadmill is that it only comes with a 3 year parts and labor warranty. Considering that this is an above $5,000 treadmill, the warranty that it offers is way below what other premium treadmill brands (like Landice) are offering. Although you might not even need it since this is a very durable machine, the warranty remains to be a concern. However, I still think that this treadmill is one of the best in the industry. So to conclude, I do recommend the Star Trac Pro S treadmill. Belt Size: 20" x 62"
If you plan on buying a Star Trac Pro S, I suggest you buy it at Amazon. You can get it for just $5,595.00.